Once you have people interested in your franchise, you’ll need a package to send them. The recruitment package is a very basic thing. A lot of people, when they get hits on their website, will send out a bit of information and then wait. To me, that’s just not enough. Yes, send some information out, but then contact them, there is a process. How many of you found me online. Okay, half of you here. 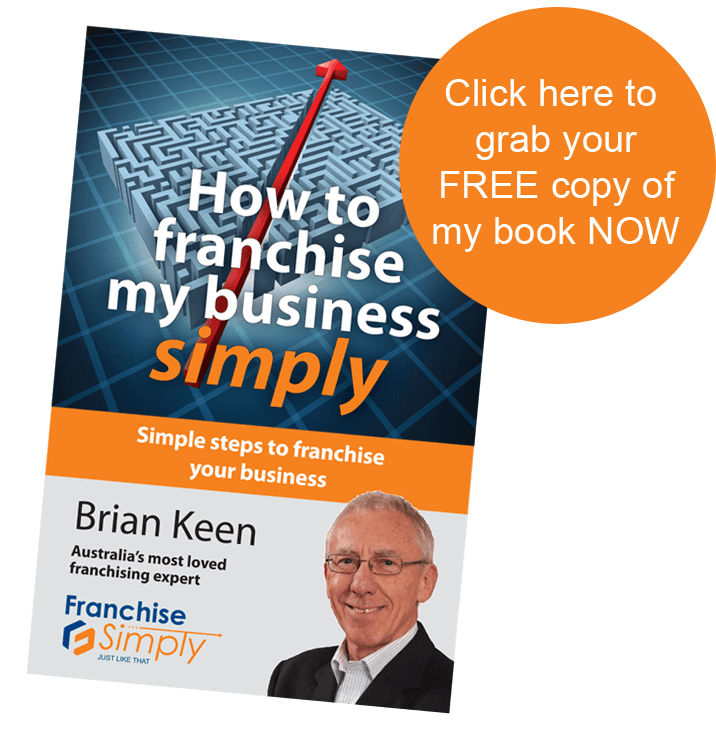 You would have done a Test to see if your business is suitable for franchising or applied for a free copy of my book. The whole idea is you get that book, you read it and the book starts to give me a bit of credibility and answer some of your questions. Then it’s worth having a chat. You want to use a similar principle. That’s something we run through in our Programs and we talk about in our recruitment workshops. It’s just horses for courses. So once you get someone contact you one way or another, you send out a letter,..
Dear John, thank you for applying, signed by the CEO or the founder of the company. You add a brochure or maybe a DVD or a USB stick or a link to a Vimeo site or YouTube where they can go and look at something. And that DVD may well be your franchisee talking about the franchise or something of that nature. And you’ll add an application form. But it’s important with your application form to ask the right questions at the right time to qualify people. You don’t want to be like a net and scoop up half a dozen people. You’ll become all excited, ‘I’ve got 6 franchises’, and then find none of them actually have the money. They’ve done the thing that so many people do. They’ve spoken to the bank who’ll say yes, we have some funding, and when they apply for it, the bank says, oh no you don’t meet the criteria or things have become tight or whatever. So, it’s important to get the right information at the right time. Don’t try and progress people too far at once, because you’re going to intimidate them. You’ve got to keep it so they’re coming to you. The old sales adage I think is still true. Give people information but don’t give them too much, so they’ve still got questions to ask. Progress through it a step at a time. Next you have a telephone or Skype call and then a face to face meeting. When you know they’ve met the criteria and they filled in some details in your application form, you’ll have some sensible questions when you talk to them. It’s a step at a time. That’s why I introduced the Franchise Health Check in my business for example, as a step in my process, because I realized it was a big jump from, ‘Yes, I’m looking to do something,’ to franchising. It’s a big commitment. So let’s go a step at a time to ease your way into it. Next, once they’ve got a bit of information and they seem good, I would always advise any applicant, before they come back to chat me, to go and have a chat to 2 or 3 franchisees. This is also a good motivation to make sure you keep your franchisees happy. They will be the sales people for you. They can ask those frank questions and they’ll tell them as it is. Question: You suggest we tell prospects to just pick a franchisee and go and talk to them? Well, I don’t have any franchisees, so I can’t ask them. What do I do? Yes, this would be a tactic once you’ve a few franchisees out there, franchisees in your own organization. With the previous example of Automasters, Greg was the first franchisee, so he’s the one everyone went to in the beginning. Once Automasters had 5, or 6, or 7, we’d say here’s the list of 5 names, go ad have a chat to any of those guys. Once you’ve got a few out there, I would suggest that and then, if they do come back to you, check if they’d spoken to them? No. Then, well I’m sorry, we can’t make an appointment to talk to you yet. It has to follow a set procedure. If they’ve ’first contacted you through an online booking form, which I’ve just moved to, they’d fill in the form to ask for the book or answer a few questions and tick a few boxes. That gives me knowledge to see where they’re at in business and what their background is and so forth. And if those boxes haven’t been ticked one way or another, then you don’t actually get the next form that comes through to organize an appointment. In my business, automating the process has saved a lot of my time talking to people on the phone, so I can be working more effectively with my clients to help them and take them through the process and do the mentoring. You can bring those tools in, but you need to get to a certain stage before you do. There’s a myriad different ways you can advertise your franchise. Business brokers obviously. Business brokers generally don’t really understand franchising, so they’re not always the best although there are the odd exceptions. It’s a bit like real estate. How many people have a real estate agent they really think is excellent? Occasionally yes, but often not, because what they’re looking for is the fee when they sell the place and whether it’s up or down a bit doesn’t matter too much to them although a few hundred dollars difference in their fees can be thousands of difference in the sale price. They’re more motivated to get it turned over fast. Brokers are a bit the same. But Brokers can be really good and you may just choose to use them. Some of my clients use a firm of Brokers to just introduce somebody and they pay a part fee for that introduction if the person goes through and buys the franchise. And then you look at franchise magazines. I work with an online magazine called Franchise Buyer. But you need to invest a bit of extra money when you first start, it gets less expensive once you’re growing and you’re looking for more franchisees as they spread the cost. Trade magazines can work, maybe you’d look in your industry. I don’t know, there’s the Nursing Monthly or the Nursing Union or the Teacher’s Union. There are places out there wherever you find a concentration of your clients. Also of course, online. That’s an important area which is growing more and more significant. From my point of view, at least half of my clients find me online but that wasn’t the case 3 years ago; so that’s changing. But there are good sites and those not so good. And there are lots of online business brokerages if you like, business sites you can go to, like Seek and so on, and some are really good. There’s one I refer people through to and it has been very successful. It actually consolidates about 20 different sites. That’s really quite inexpensive and you can pay them, not on a commission basis, but on a click basis. They’ll set it all up for you, recommend the sort of copy to use, and you just pay on a success rate, just as with Google Ads. You can spend an awful lot of money on wasted advertising, just as you can with promoting a product. You want to make sure it’s hitting in the sweet spot and getting to your client base as well as you can. And hopefully, if you’ve a business where you can identify prospects, say in Ray’s case, maybe you can find out who’s got a Hewlett Packard machine or what office size suits, then you can get a telemarketing program together for businesses or your offices of 7 people including an IT department, or an accountant, or a bookkeeper, or whatever it might be for your criteria and then you can get to those people, get their email addresses, get their physical addresses, get their phones, you send them out an email, follow up with a letter, then somebody rings them. All those things can be done. Has anyone any suggestions? Any one got any thoughts as to where they might find prospective franchisees? Female Speaker: I thought, possibly current customers and as you said, reps as well. The best sales person that I’ve had, had a beauty therapy background, a qualified beauty therapist but then she went off and sold freight, like a freight service or courier service for a while. Through that experience, she learned some fantastic sales techniques and so that combination of the two skills together was fantastic. And through doing the DiSC profile, I’ve worked out that she’s an ‘I’ which I wouldn’t have known before but that’s great because now, I know what I’m looking for. Yes, so there you’ve got your sales person. Excellent! Any other thoughts? We’ve covered a fairly broad area there. So you can see, when you do a little bit of brainstorming, it’s surprising what pops up, but always be prepared for the unexpected because that’s what happens. If you’re out there doing things, things happen. Once you start – hey here’s something that’s popped up. And what is it, I don’t know because you’re out there with this energy, putting in that space and you’re doing things, solutions and ideas and people come along. You bump into them. It really, really does happen. There’s no two ways about it. One of the key people in my organization came to chat to me about something totally different at a franchise expo and now she’s on my team. So it’s just great to see the way it can evolve. website franchisee driven if it’s used for your retail or service business. Just have a tab there maybe or you may want a separate website, because you don’t necessarily want your clients looking in detail at the information about the franchise. I wouldn’t give too much away on the website, but you’ve got to give a bit of sizzle to encourage people to click through to give their details and then they can get an email every month or every week or whatever it might be. People these days look around. If they’re looking at you, they’ll probably be looking at 6 others, so you’re going to provide them with just a trickle of really good information, knowledge that’s going to help them make a decision and probably be educational. So they’ll say, oh yes, these people know what they’re talking about. So when they are ready, you’ll be on their shopping list. The best you can hope for is to be one of three. If you got a chance to be in the top three on their shopping list, usually you’ve a chance to convert. And if you’re up for it and they’re the right sort of people, you should be getting more than your fair share. It’s as simple as that. Social media is a big thing. It depends on the industry. Facebook is 70 to 80% female driven, so beauty therapy and children’s areas are huge, so are holidays and all those sorts of things. If it’s something like floor stripping, has it got a space on Facebook, I’m not sure but it’s changing dramatically. For business to business, it can be quite important. It’s surprising these days and you pick up a lot of information. You’ll get an email saying these 3 people have been to your website or these people have been to your LinkedIn page. We look also at the business for sale websites. One that’s a little bit of a sideways, which we found worked really well, wasn’t liked by the newspapers or employment websites, is placing an ad in the jobs vacant, positions vacant sections. If you put an ad in the positions vacant section, talk about career and investment opportunities. Say you’re looking for a sports manager who’s interested in a career path to business growth or something like that. It’s surprising how you can find people. The whole thing is to make sure that your process makes sense. That there is synergy in the process and people understand it – take everyone through it step 1, step 2, step 3. It’s a challenge to be disciplined because we all get excited. We all have information to share but you’ve got to try and keep it simple – so remember – it’s step, by step, by step, and then people can get their heads around it and you’ll qualify your prospects better.